Great post Bob. Your effort at the vineyard and the passion in your writing shows this is more than a “hobby.” I just know your vineyard will make it. Best to the VG. Steve, thanks for the comment. How’s your vineyard coming along? You were definitely going about it in a very professional way. I’m envious that you had an actual geologist on your team! Great summary of a valiant effort. Being part time Afton people, we can relate to the logistics. 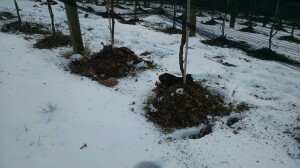 The use of composting leaves anchored by snow was brilliant. We have been trying to nurse a bay tree through each winter w/ no success. Each time we try to provide insulation, the winds coming down Elk Mountain dismantle whatever we build. Still planning our vineyard – timing is always a problem – ordering rootstock commands a lot of advance planning. Also, like many subjects, the more you know the more you realize you don’t know. Dave, thanks for leaving the comment. Nice to know we’re not the only part-timers in Afton! Hope to be there full-time someday. How big a vineyard are you planning? Figuring out rootstocks and clones can be challenging. We went for 101-14 for just about everything, although I think we ended up with something else for our Merlot. I’ll have to check my notes, since my memory obviously is deficient! We went with Entav clones for almost all our varieties. For a small hobby vineyard like ours, we could have made our lives a lot easier by going with fewer varieties, but it seemed like it would be more fun to have a few different things to work with. And it was…up to a point. Oh, well. You live, you learn. Wow. Great piece here, Bob. “It takes years of hard work to establish a vineyard, but only one bad night to lose it.” A sobering reality for those wine enthusiasts like that that harbor (a small) desire to buy a farm and grow grapes. All the best for a fruitful 2015 harvest! Frank, thanks for the note. While I was writing this, I was thinking back on a blog post you did a while back on global warming and climate change (Is Early the New Normal?) Global warming is having a huge impact upon viticulture, but the aspect of climate change that has had the greatest impact upon me is the increased number of extreme weather events. Last year we had the polar vortex, and I never dreamed we’d have a second consecutive year featuring extreme cold, but this year was even worse. 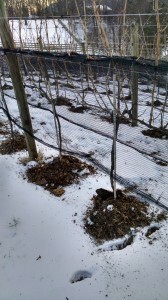 Well, the -6 degrees we got was better than what was forecast, and hopefully everyone will do okay, especially since the freezing weather in the preceding weeks helped the vines to harden off. But I have to say, I’m about done with the cold. Awesome post! 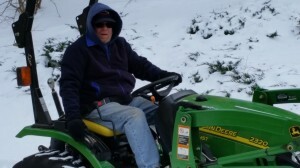 Gotta keep warm when taking care of those grapes!